Besides my love affair with chocolate cakes, I have a love affair with the TYPE of texture of the cake. 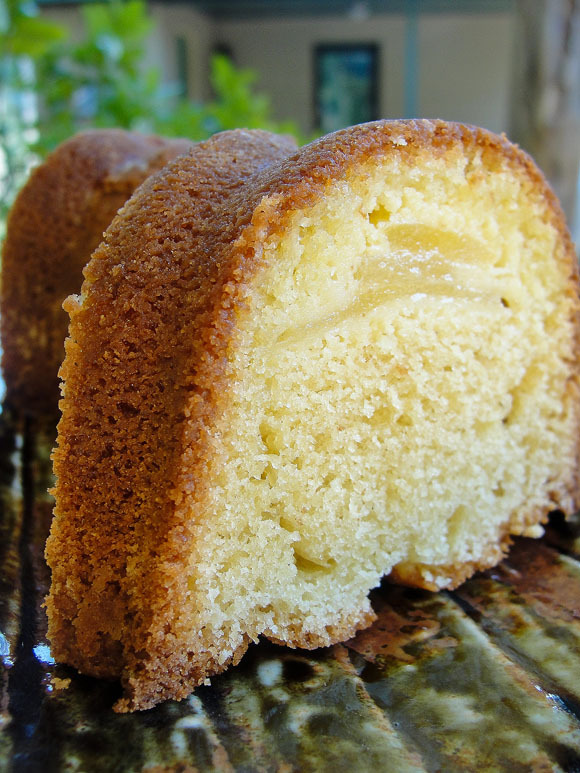 I like mine to be dense – a la pound cake consistency. Those types of cakes remind me of my grandmother’s homemade cakes, heavy on the butter, eggs, with a bit of sour cream to give it a tangy taste. Yep, those cakes are close to my heart. So when I flipped to this weeks Heavenly Cake choice and read up, I was pumping fist in the air and yelling around the house – SCORE! Not even the fact that it had a fruit in there could damper my expectations for it, because according to this, the pears would disappear through the cake, end up at the bottom, which will then be the top and well… its all a bit like maaaagic. The fact was that if they all end up at one location in the cake, in this case the top, meant that I had plenty of “pound” cake-y goodness to eat without any fruit in it. Oh, and the cake had almond cream in it – hello there! DOUBLE SCORE! (you did not see that, ok). And just for the record, I love pears, especially with gorgonzola, but that’s for another future post. Me: “nope, it has fruit, you would like it”. Me: “Opps, can’t hear you, loosing you… ohhh, ahh, sorry” CLICK! When I got home, everything was out and at the proper temperature; yes he makes for a great sous chef. And the cake came together super fast. Even pealing the pear was fast! You start by mixing the almond paste, an egg, some flour, sugar and make that into a yummy, delish cream. Put it aside, as in far, far away from your line of vision. Actually I suggest you hide it, because if you don’t it may be eaten by the kitchen fairies and then were would you be? Then it was just a matter of mixing the rest of the ingredients to get the cake batter. The dry ingredients first, then adding the butter to it, then the eggs with sour cream and everything else in the necessary two parts and then dumping everything in my ugly bunt pan (because, seriously I’m having so much pan envy, and if you don’t believe me, all you have to do is check out my fellow bakers sites to see what I mean. It’s not funny – specially since I been given a warning of NO MORE BAKING CAKE PANS by Tom. Then you create a bit of a indentation in the cake batter not to close to the middle not to close to the edge. 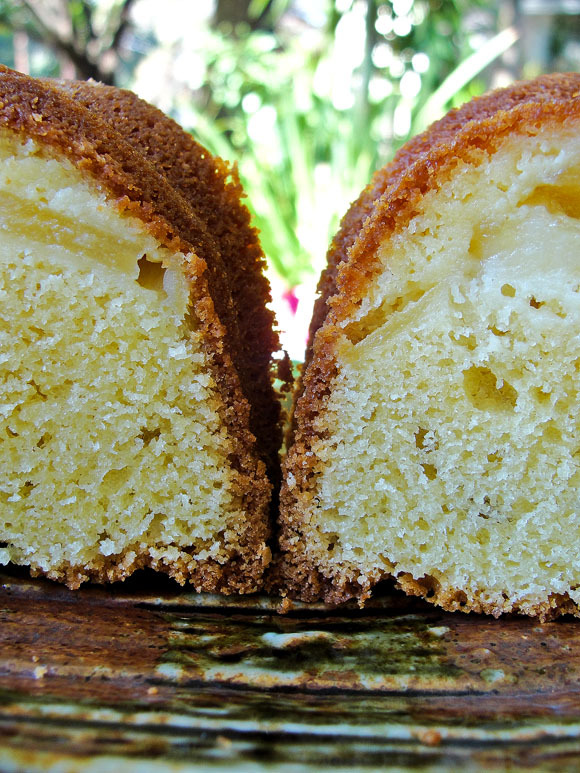 Fill it up with the almond paste and topping your pear slices around it. And all that goodness goes into the pre-heated oven. And like everyone else in the group, completely become mesmerized when those pears start to sink into the batter and voila – magic! Only to reappear when you cut into the cooled cake, right there on the top, just like the recipe said they would be. I’m giving Rose a standing ovation for teaching us magic as well as baking. Think of the dinner conversation! She is giving you not only a baking treasure, but chatty material as well. And a treasure it was. Me – I ate a whole piece. Cook pears and all. I’m not saying anything more; I think just the fact that I did not pick the pears out of the cake speaks volumes of how good this is. This one has moved up to the top 10. How could it not, I did show you the crumbs right?